What are the best mocking frameworks available on Linux? I entered the unit testing world about a year ago and now my team and I start working with Linux. Which mocking framework do you think is the best for Linux and why? Re: What are the best mocking frameworks available on Linux? A senior software tester and a entry level tester went into the company cafeteria and sat down. The senior employee removed a tuna sandwich from an old brown bag. The entry level tester promptly removed a ham sandwich from his man-purse. Then a security guard noticed that these employees were breaking the rules and quickly came over to the table. "The company rules clearly state that you cannot bring your own lunch to the cafeteria!" the guard exclaimed. The senior tester looked at the security guard, then shrugged his shoulders and exchanged sandwiches with the entry level tester. "I found a loophole in the company rule." he commented with his mouth full. Maybe someone with more test experience will answer your question. You might get greater visibility by posting your question in the 'Quick Answers' section. All my code is C so unity, ceedling and cmock and it's irrelevent if it's linux, windows or embedded code. At the end of the day you are testing the code not the compiler implementation and optimizations of the code. There are also forums there if you need to ask questions. Nice! What are their mocking abilities? What to do to fix this? Also, I would suggest not using the class name for an array in that way. And the field variable is not available outside of the method that creates it. I have changed that, but now how do I use it in this part? also, I don't really understand what you have done in the new string[area][area] part. Why use string instead of field? how do I use it in this part? Exactly the same as before. the new string[area][area] part. Why use string instead of field? Because you are trying to create an array of string objects. See new Operator (C++)[^]. I hope that someone can help me. These values then will be sent to Raspberry Pi where we do the calculations of force feedback. I’m using the RS232 protocol (library developed by Teunis van Beelen [link]) to receive the data from Arduino.I'm using a usb cable to send data from Arduino To RPi. My problem: I received the data packets from Arduino every 10ms, BUT, sometimes the packets are cut into two parts (see figure 1). I can say that for every 100 data packets sent, 6 will be cut. So I will receive 6 times incomplete data packets for the calculations. The "incomplete part" will come together with the next data packet. 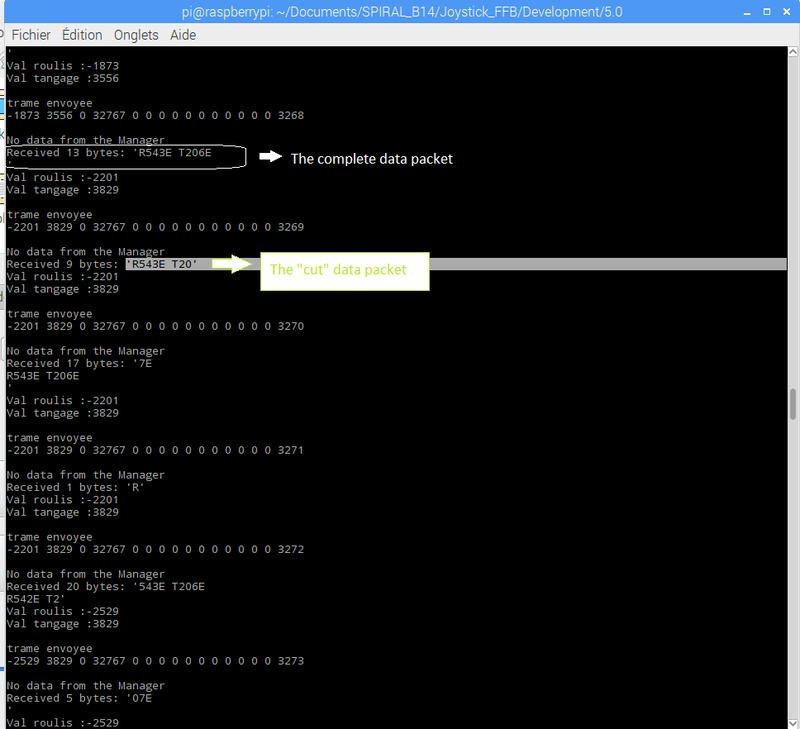 For the time being, if the data was cut, the code will just "jump" the data packet and will not do any calculation. But, for optimisation purpose, I need to resolve this problem. By the way, the baudrate is the same for Arduino and RPi that is 115200. The whole program is being developed in C++, so it is not advisable to use pyserial because the program need to receive and calculate the force feedback within 10ms. Can someone explains why and how did these happen? What do I need to do to resolve this problem? Feel free to ask if you guys need more info from me. You have to rewrite your code to be able to handle incomplete packages. You got incomplete packets because you stop receiving if any number of data has been received (even a single byte/character). That would be the normal behaviour. The only reason why that happens not very often is that the system has to service also other tasks. And that is not done while waiting (see end of my post)! By the way: what is the purpose of the undefined variable i here? But when doing so you will run more into the already existing performance problem of using a polling loop. Waiting for the data wastes a lot of time (10 ms) that is not available for other tasks. The solution is to put the receiving into an own thread and use the fine Qt signaling features. Because there are only two event data values, there is even no need to use shared variables. I don't really understand what you are doing here? Can you please explain it a bit more and detailed? And where do i need to put this code, is it after I received the data from Arduino (after printf to see how many data in the string?). By the way, i just started coding two months ago. I'm sorry if I asked a lot of questions. Like you said, I would prefer to not use polling because the program needs to be really dynamic(10 ms). When you said "put the receiving into an own thread", do you mean put the received data in another string? I don't really know about the Qt signaling features. I just took a hold in this project two months ago and just started doing Qt 2 weeks ago. Would you give me a link that would help me to understand the features and why and how to use them? When you send data with the format "R%03dE T%03dE" it will be of fixed length like in "R450E T030E". The length is 11 characters plus the the line termination appended Serial.println(). Assuming that it appends a single LF and not a CR-LF pair, the length will be 12 bytes. An application can be splitted into multiple threads. You typically have the main thread that is doing the user interaction and screen outout (often also called GUI thread) and background threads that perform asnychronous operations like networking or serial communication as in your case. If you execute such polling operations (or calling sleep()) within the main thread that will be blocked for long times resulting in lags and stuttering screen update. Note also the error check in the above code. Without that your application would stuck forever when the serial connection is interrupted by unplugging the cable or switching the Arduino off. The solution is to create a worker thread that receives the data and uses events to signal the main (GUI) thread when new data has been received. The main thread then handles the event and can update the screen with the new data. However, using threads is an advance programming topic so you might proceed with the polling for testing the communication. But sooner or later you would have to use threads. The thread itself can be implemented as pthread or QThread Class | Qt Core 5.10[^]. Inside the worker thread use a QEvent Class | Qt Core 5.10[^] to signal new data to the main thread. In any case read the Qt documentation for the used functions which includes example code. You might also search the web for additional information. The Terminal Example | Qt Serial Port 5.10[^] and Blocking Slave Example | Qt Serial Port 5.10[^] might be for example of interest.